" I got notice! Now I can afford to got to the school I want." "I did not know it was a such a complex process. Thanks for putting me in front of the pack." 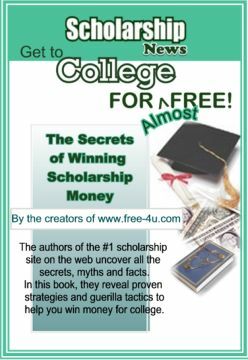 The Staff of Free-4u.com has designed a book to help you better prepare yourself for the scholarship process. application process, sample essays, interview tactics and much more !! Get the Edge you need. LEARN the secrets. And Get the money . NOW! Order your copy today and Start earning money for school.
" I got scholarship money with my C+ average. I never thought it was possible. Thank you for giving me a new beginning."